The overhead is an abbreviated serve. You should use a continental (2) grip. It will help you generate spin so that you can swing fast and swing up. Most people are afraid to come to net because they either don’t trust their volleys or they don’t want to be lobbed. 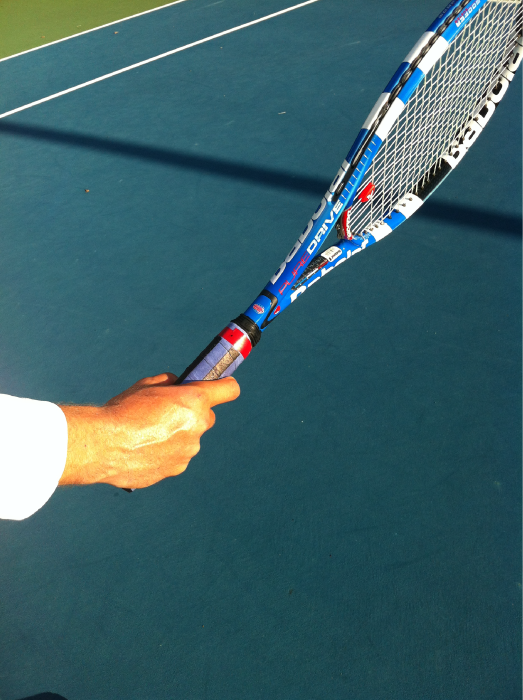 In order to be comfortable at the net it’s important to have an efficient reliable overhead. 2. Talk on the telephone. 4. High five the giant. You swing up more to the contact point with the overhead compared to the serve in order to overcome the downward trajectory of the falling lob. Ideally at the point of contact your body should be in a straight line, at a 45 degree angle into the court and 45 degrees to the right (left for lefty). This is known as your power-line. Your shoulders should be facing the net-post to the right ie. 45 degrees away from your target. Eyes should be focused at the point of contact to help prevent the body and head from shifting and opening up.